All of our foods are prepared with love on an open wood burning stove. We serve an eclectic offering of fresh healthy foods derived from classical Jamaican, Indian, Chinese and Creole cuisines. The chicken and fish are grilled. 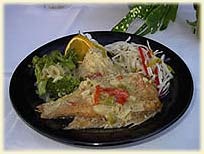 Vegetarian meals are also served. If you choose to fast, fresh juices are available. No dairy products are used. Seasonal vegetables and herbs are grown in our own garden. Breakfast Menu: Ackee, Grits, Johnny Cakes, Papaya, Pineapple, Banana, Sweet Basil Tea. Lunch Menu: Black Bean Soup, Organic Green Seaweed Salad with Lime/Honey Salad Dressing, Watermelon Juice, Coco-Bread Strips with Rosemary Olive Oil. Dinner Menu: Grilled Tandoori Bonita, Peas and Rice, Callaloo, Wild Green Salad, Pineapple/Lemongrass Tea. No dairy products are used. Seasonal vegetables and herbs are grown in our own garden.